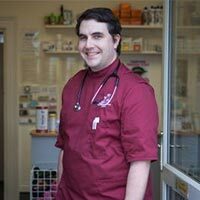 I joined the Twickenham Veterinary Surgery Team in April 2016, having worked for a while in a veterinary hospital. My days can vary a lot, one minute I will be vaccinating a pet, consulting and interacting with owners, and the next I can be operating or dealing with an emergency. I have a particular interest in internal medicine which I will be pursuing in 2017 by studying towards a certificate which may take 3 - 5 years of further study. I think the thing that I enjoy most about my job is meeting all the animals and discovering all their different personalities as well as following and helping them at different points in their life. At home, I have two cats: a big friendly black bear called Minion and a temperamental tortoiseshell called Bernadette.